Awning windows open outwards and upwards, which is their main advantage compared to other windows, as they can stay open in any weather. Moreover, with these installed you can provide your house with proper ventilation, yet keep the rain out. Additionally, they have a high energy efficiency rating due to their compression seal, which eliminates the gap between the sash and the frame and does not let hot air escape. Awning windows have a crank handle, which makes them easy to operate. The frame and sash of the window are constructed from a high-level UPVC compound, and the corners are welded into a monolithic unit, which makes them durable and weather-resistant. Awning windows have no rails or bars, so you can enjoy an unobstructed view outside. Thick, insulated glass ensures energy efficiency in your home. Awning windows are easy to clean due to their 90-degree opening angle. We offer a wide selection of colours and materials. Choose from white, beige, satin, brown, or brass to compliment the style of your home. 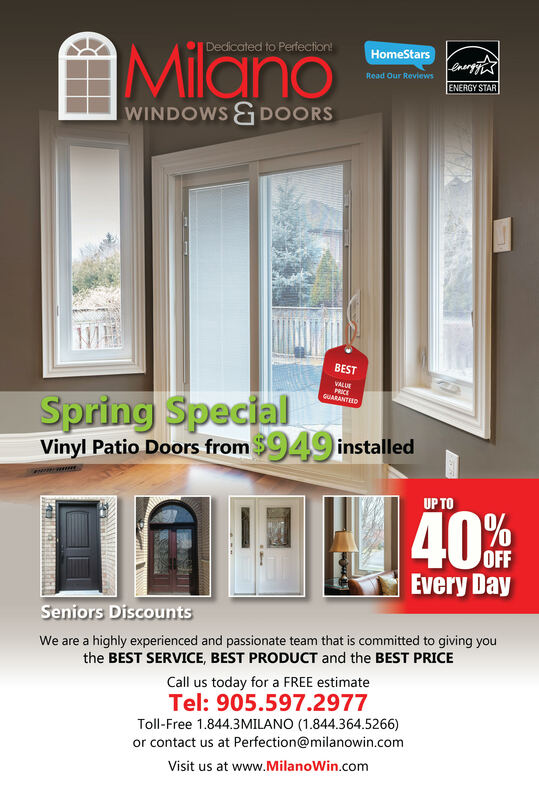 Milano Windows and Doors Inc. specializes in awning window installation. With hundreds of satisfied customers over the GTA, we can guarantee you will not be disappointed with our services. Our team consists of licensed and trained professionals who make sure that every project is done mistake-free. We guarantee the quality of our products, and that’s why we offer a transferable lifetime warranty that covers defects such as flaking, blistering, peeling, corrosion and fading of the vinyl frames. If you want to save on your energy bills and keep your home safe, give us a call at 905-597-2977 now, or for toll-free call:1-844-364-5266 or (1-844-3MILANO).